"Cool Medal and awesome views!" This was my first time running Surf City and I really enjoyed it. and am sure I will be back! I stayed at an Airbnb about 2 miles from the race because I had planned on taking a few extra days to relax at the beach and the hotels are rather pricey. Unfortunately the weather did not cooperate. I did get some time walking along the beach but not as much as I would have liked. Anyway, back to what I though of the race. 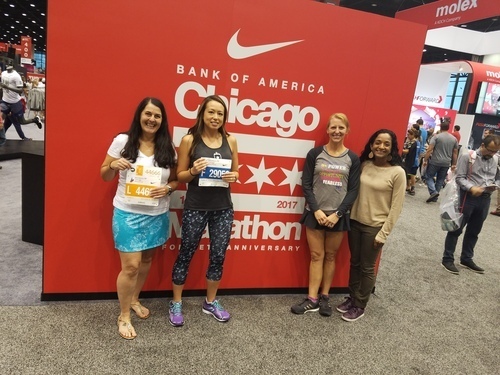 Race organization: There were quite a few emails leading up to the race with all the information you could want/need which was much appreciated since I was coming from out of state and had never participated in this race before. Expo: I thought the expo was decent sized but I did not like that they have quite a few vendors that had nothing to do with running or fitness. I would have liked to see a few more options as far as shoes. I am in need of a new pair and would have bought one had there been more vendors with more options. The expo was set up very nice and easy to navigate. Packet pick up went very smooth and they even had a shirt exchange in case yours didn't fit. That is a huge plus in my book! Parking: During the expo there was free parking right near the expo. It was raining pretty hard that day so that was a bonus to park close. Race day parking was not bad. There were hotels that offered parking but the $40 was a bit steep so we found metered parking on the street and paid $10. We were only a few blocks from the race so it was nice for a pre race warm up. Race and Course: I prefer an early start time so I had wished that the half marathon would have started earlier. I know some people run both the 5K and the half but if it would have been sunny or warmer it would have been an issue for me starting that late. The corrals have a time listed but as we all know most people do not start in the corral that they should so for a bit it was tough getting around people who were slower. I know there is nothing the race can do to prevent that unless you have to show proof of time and then the corrals would have to be assigned as well. The course had beautiful ocean views and it was primarily flat. There were a few areas that got a bit congested so it was a bit slow moving. There were a few inclines/rolling hills that I was not prepared for because the description said the course was flat. But it really was not bad. There is not a lot of crowd support but the volunteers and the other runners/walkers made for a fun race. Aid Stations: For most of the race the aid stations were great! They had plenty of water and Nuun as well as honey stinger gels but, towards the end they seemed to have less volunteers manning the stations. I am slow but there were still a lot of runners/walkers behind me yet. Swag: You got a cool bag which was decent sized. The surfboard medal is one of my favorites! I like the v-neck tech shirt we received and blue is my favorite color so I was very happy with the color. The post race food was the usual, bananas, pretzels, protein bars, fruit cups and chocolate milk! Plus they had the sand bar (beer garden) which was perfect for after the race. I always love a beer when I am done with a race. They also had a great band and I wish I would have stuck around a bit longer. Overall I really enjoyed this race and it is one I would highly recommend. I am hoping to run this one again. 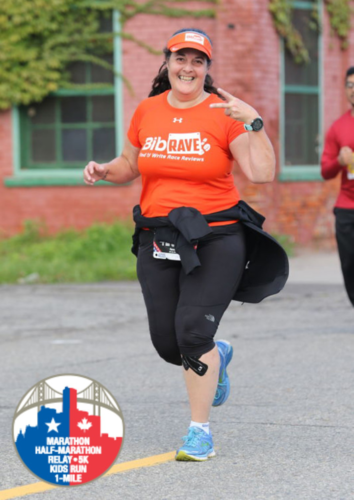 When the opportunity arose to run the Detroit Free Press Marathon for BibRave I jumped on it. This is one of the races that I have always wanted to run because I have heard such great things about it, plus my Dad ran it many, many years ago and I always like running the same races as he ran. I knew that I would not be able to run the full because I was running one a month prior and my body cannot handle two that close together, so I chose to run the wonder challenge (my first ever challenge) which consists of the 1 mile and 5k on Saturday and the International half on Sunday. The challenges were new this year and filled fast. There were some nice perks with running one of the challenges. I received a shirt and medal for each race as well as a pint glass AND final medal for the challenge. The shirts ran a bit small but they had a place you could exchange for a different size so I was able to get some that fit me better. I like when races do that because it is hard to tell what size you will need depending on the manufacturer of the shirt. So this added touch was much appreciated! This was by far one of the most organized races I have ever run! The expo was very big with everything you could want or need. One of the best expos I have been to in a very long time. It was a bit cold out on Saturday but I like running in cooler weather so I was fine with that. First up was the 1 mile race followed by the 5k. The 1 mile course was flat and fast and the 5k had some great views as you ran the last part along the Detroit River walk. You had a view of Canada as well as the Detroit River and part of the skyline which was very cool. I saw tons of photographers on the course and I wound up with a few really nice pictures. And the best part is they are free! They had water bottles, chocolate milk, fruit, bars and pretzels after each race. I liked the variety of snacks they had. Later that day I was able to go to a “behind the scenes” of the Marathon led by Executive race director Barbara Bennage. It was cool to get to learn a bit more about the day-to-day operations of getting ready for the race as well as getting to go to race headquarters and see the start line of the race ahead of time. One of my friends (Sandra) could not make it to the race but they let me pick up her shirt and goody bag. That was much appreciated! Sunday came and it was time to head down to the start line. My friend Linda was also running the race and her husband Gordy was going to cheer us on. We parked for free at the MGM and got a spot on the first level! It was a bit difficult getting to the parking garage with all of the street closures but we eventually found a way around. We walked over to the start line which was a little over half a mile away. It was a pretty cold morning but with having Gordy along we were able to wear a jacket and give it to him right before the start. I would have liked to see a few more port a potties near the corrals though. The race started and I waited about 20 minutes until my corral took off. Running over the Ambassador Bridge was a highlight and the views going over the bridge were amazing! You could see the Detroit skyline as well as Canada and it was breathtaking. I did stop to take a few pictures but I moved to the side of the road. Not everyone did which could be a problem if you were trying to get around them. My only major complaint has nothing to do with the race but all to do with the participants. I do a run/walk and have even walked a half marathon before but when I do walk I stay off to the side and try not to block those running. The issue I had was too many people walking side by side three or four across and you could not get through very easy. There were a lot of walkers that started in the same corral (L) as me and that should not have been. It is not only frustrating but can be dangerous. That is why they ask for a predicted time so that you are in the correct corral. That would probably be my only negative to say about the experience I had those two days. Running through Canada was really cool and the views along the river were awesome. I wasn’t sure what to expect running through the tunnel back into the US, but I have to say it was kind of cool knowing you were running underwater. The volunteers, the police and the border patrol were absolutely the best! They were very encouraging. high fiving all the runners. The volunteers were right there with water, Gatorade, fruit and gel when needed. I honestly cannot say enough about the wonderful volunteers! I did not see as many photographers on the course like I did at the 5k the day before but I did get a few nice pictures from the half. I did not have any issues finding my pictures but I heard that quite a few others did have trouble. I was not a fan of how you had to locate them (through face recognition) and although there some that were mixed in with mine that were not even close to being me, I did find quite a few and most turned out well. There was also a neighborhood that had a few tables set up and the residents were handing out pretzels, licorice, popcorn, fruit, as well as several other yummy food and drink items. 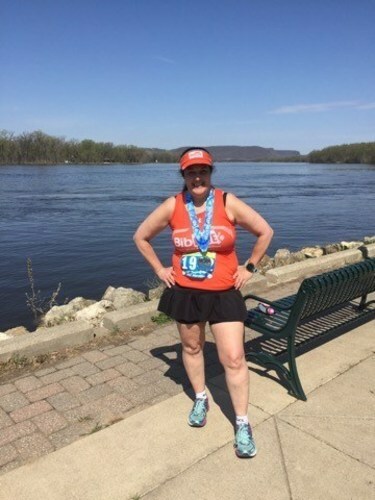 I liked how the full ran with the half almost the entire way but if I was running the full I do not think I would have liked coming that close to the finish line and then still having to run a half marathon. I was happy to see the finish line because at that point I was ready to be done. They handed out a bag with all sorts of goodies (fruit, crackers and fruit snacks) as well as chocolate milk and water. I did not stay at the after party because it was cold and I was sweaty and just wanted a hot shower so, I headed over to pick up my final challenge medal. The medals were super sweet! Of all of the races I have run this one was by far in the top five due to the organization, the course, the volunteers and the swag. Overall I really enjoyed this race and would love to run it again sometime. A few short days after the race I was able to claim my results on Athlinks! I highly recommend running this race and I will definitely be running this one again! This was my first official race as a BibRave Pro and I was very excited. This also was the first time running this race. With this being a small town race the expo was very small and there were not too many vendor booths so I headed right over to pick up my bib and shirt. I do love the color of the shirt and it is super soft. They assigned you a bib number when you picked it up instead of having it already assigned. I realized I had forgot my running shoes but thankfully I wore a pair there. They had to come out of retirement for one more race. Glad I didn’t forget anything else! The next morning came around fast and I felt ready to go even though I did not sleep the best. I hopped in my car and headed off to find a parking spot. Not a lot of information was really given as far as parking so I drove around a bit and then decided to text fellow BibRave Pro (and Captain) Gina. She suggested a parking lot that is across the street from the shuttle bus pick up. There was plenty of room there and it was very convenient. It was not too far from the finish line either. They had a line of busses waiting to take us to the start line which is up at Grandad Bluff and the views are simply amazing! Make sure you head to the start a bit early so that you are able to take some awesome pictures as well as enjoy the view from the top of the bluff. The race started and I took off feeling great as it was a beautiful, sunny day. About the first 2-1/2 miles were all downhill. My quads are still a bit sore. It heated up fast and was over 70 degrees by the time the race was finished. There is quite a bit of elevation change during the first 7 or so miles. Then it is pretty flat for the rest. Most of the course goes through neighborhoods and on a great bike path. It was a beautiful course. The cheer squads and the volunteers were awesome and kept you going by cheering you on as you ran through. The water stations were great and fully stock with plenty of Gatorade and water and they were very well organized but did not see any gel on the course and I thought they would have some. Maybe they did and I just missed it. I usually don’t use anything due to stomach sensitivity so it was not a big deal. but, the did have gummy bears which tasted great! I do wish that they had ice on the course though because I know that would have helped to cool me down. Although, around mile 11 the ice arena had made snow and there were people throwing snowballs which I thought was awesome. I caught one and used it to cool off. The pile of snow looked tempting and I wanted to go lay down on it but I knew I wouldn’t get up and I just wanted to finish. As I was approaching the finish line there was still quite a crowd and they were cheering me on. I felt awesome at that point because I knew I was almost there and their cheers were giving me the energy needed. The finish is in Riverside park right alongside the Mississippi River and it is absolutely beautiful there. My daughter snapped a few pictures of me running down the finishers chute and crossing the finish line. Then after I finished we snapped some more pictures with my medal (which by the way I love). It is one of my favorites to date! I could not wait to go grab a tasty brat compliments of Festival Foods who is the main sponsor for this race because at this point I was starving. It tasted amazing! They also had cookies, bananas and chips. I saw someone with chocolate milk but could not find where they got it from so I had a beer. An ice cold beer always tastes great to me after a race and this beer was earned. For a small town race I have to say that overall I think they did a great job. I hopped on to Athlinks later that afternoon and claimed my race results! I couldn’t believe they were ready to claim that fast! Great job Athlinks! I do recommend this race with it’s beautiful course and great volunteers. If you sign up early it is very reasonably priced. I hope to go back again and finish faster next time. 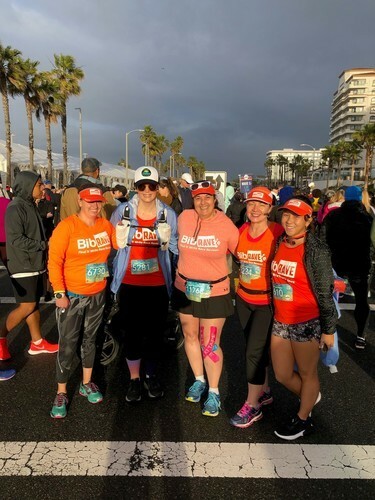 This was my second race as a BibRave Pro AND my second year running the RunMadtown 5k twighlight run and once again this race did not disappoint! It was a warm 83 degrees around the start but thankfully there was a little bit of a breeze. The expo was held at Monona Terrace Community and Convention center which overlooks beautiful Lake Monona. We picked up our race bibs, shirts and a glow necklace. I loved the color and design of the shirt. It is also very soft and comfy. The shirts are gender specific and women’s shirt has a v-neck which I really like. The expo is quite small but they had a some booths that I stopped at. I did not purchase anything but I did find a cool race that my friends and I may run in September. I had downloaded the app several days earlier for all of the race information and so that I could track my friends that were also running. There were a lot of great features on the app including event info, packet pick-up, live video, course maps, results and so much more. You could also take pictures right from the app! You also received several emails leading up to the event with all the information needed to make this a great race. I really appreciated that touch. I felt like you were kept completely up to date on everything related to the races. There is plenty of parking so you never have an issue with finding a parking spot for any of the events and parking is free after 6pm. We were there quite early so this year I was able to watch the kids race. They ran a loop around the capitol building and they all looked like they were having a blast even though it was quite warm out. Shortly after the kids race it was time to start the 5k which started at 8pm. I knew I would be slow due to the heat. It was around 83 when the race started but thankfully there was a little bit of a breeze. I do not do well in the heat especially when I have not acclimated to that type of weather. Although I was super slow and had to even walk quite a bit I had a fun time. I really enjoyed the course which was new this year. There was plenty of room with the exception of a The only thing I wish they would have done is maybe add an extra water stop because of the warm weather but at the one they did have the volunteers were great! It was an out and back and there were a few inclines but nothing too major. It is getting dark as you head back towards the Capitol building which is a site to see all lit up. Everyone receives an awesome, high quality medal. If you run the Conquer the Capitol challenge which consists of the 10k Saturday night and the half marathon on Sunday, you not only get three shirts but you get three medals too! After you finish they have water, pizza, chocolate milk and beer. My Dad and some friends have been running this race for years and keep going back because of the great organization, fun atmosphere and all around amazing race! 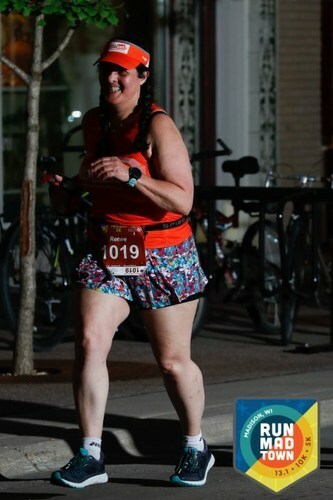 I really like how this race has free race photos courtesy of Focal Flame Photography, and they were ready within a day! They do a great job and usually have quite a few pictures to choose from. The race results were immediately available. I would recommend this race not only because it is in my home State but because it is a fun, well organized and all around great race! This was my second full and the experience was much better than my first full. The expo was great with lots of vendors and something for everyone. I bought myself a long sleeved tech shirt as well as a new pair of shoes then grabbed a quick picture with Bart Yasso. I thought it was awesome that if your shirt did not fit you could exchange it right then and there. Mine fit perfect and I loved the color and design so I was able to skip that area. Most races I have been to you have to wait until after the race to exchange if they even allow it at all. 2 thumbs up for the expo! I stayed at the host hotel and it was so convenient for the start and finish of the race. I got there a bit too early because I did not know how it would go but, the security check went fast and was very easy. With all that has been going on in the world it made me feel very safe that this extra precaution was taken. The officers on the course really made me feel safe as well. I was with some friends so waiting in the corral was not bad. My only complaint would be that I feel they waited too long in between the corrals to let the next one go. I was in the last corral so I did not cross the start line until about 8:45. The weather was a bit warm for me and I struggled and did not do as well as I wanted but I did get a pretty nice PR. It was great to have water, Gatorade, sponges, ice, gels and gummies for those of us back of the packers. The crowd support was amazing! Spectators were spraying us off as well as handing out candy, pretzels, chip and PB & J sandwiches. Mile 12 my friend Jenn was there and gave me some salt tablets and a hug to keep me going. Mile 13 they had a big screen with messages from family and friends. I had several people leave me messages but I only saw one on the screen. But, they did send us a email after the race with all of the messages that were sent for us. I thought that was a really cool idea. At about mile 18 I was able to see my Mom and some friends who came to cheer me on. Grabbed a quick hug from them, let them take a quick picture and I was on my way. The course was mostly flat with just a few inclines. I was glad to be done and collect my medal which I absolutely love! I missed the after party because it ended before I was done but I still got a beer and some food. This was an amazing race and very well organized. I would highly recommend this marathon!